Abstract: Neuroblastoma (NB) is a pediatric cancer of the sympathetic nervous system which accounts for 8% of childhood cancers. Most NBs express high levels of the disialoganglioside GD2. Several antibodies have been developed to target GD2 on NB, including the human/mouse chimeric antibody ch14.18, known as dinutuximab. Dinutuximab used in combination with granulocyte–macrophage colony-stimulating factor, interleukin-2, and isotretinoin (13-cis-retinoic acid) has a US Food and Drug Administration (FDA)-registered indication for treating high-risk NB patients who achieved at least a partial response to prior first-line multi-agent, multimodality therapy. The FDA registration resulted from a prospective randomized trial assessing the benefit of adding dinutuximab + cytokines to post-myeloablative maintenance therapy for high-risk NB. Dinutuximab has also shown promising antitumor activity when combined with temozolomide and irinotecan in treating NB progressive disease. Clinical activity of dinutuximab and other GD2-targeted therapies relies on the presence of the GD2 antigen on NB cells. Some NBs have been reported as GD2 low or negative, and such tumor cells could be nonresponsive to anti-GD2 therapy. As dinutuximab relies on complement and effector cells to mediate NB killing, factors affecting those components of patient response may also decrease dinutuximab effectiveness. 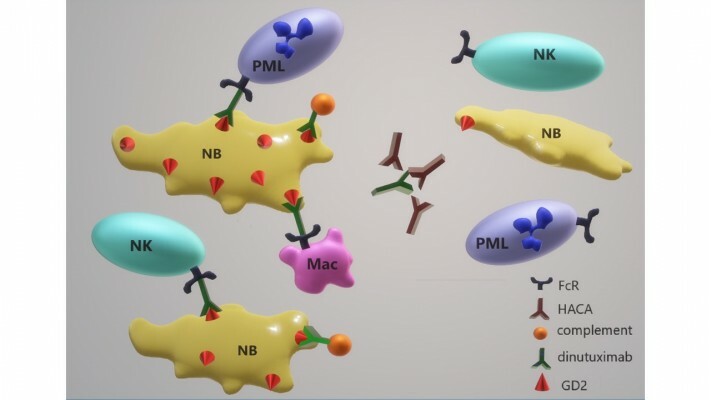 This review summarizes the development of GD2 antibody-targeted therapy, the use of dinutuximab in both up-front and salvage therapy for high-risk NB, and the potential mechanisms of resistance to dinutuximab.